I’m guessing after Swans reformed (and Angels of Light ended), Dana Schechter probably had a bank of riffs and ideas waiting to be used. Insect Ark is a project that builds off of old school horror soundtracks and doom/stoner metal concepts unlike Angels of Light‘s radiant and obsequitous folk deposits. I’m not that familiar with her previous material, but Portal/Well captures many of those aforementioned notions sufficiently by combining electronics and traditional instrumentation (with Ashley Spungin on drums). Many of the tracks start out with electronics passages and then develop outward with thick basslines and thick drums. Before any comparisons between Zombi or Ozric Tentacles are made, check out the resonance of “Octavia” which beats a drum kit soundly over a churning synths and and an equally flogging bass tone over 8 minutes of very solid doomy weed smoke building. The wanking prog is not here to my pleasure (though I do enjoy that from time to time), it’s just straight up trudging tempos and consistently brooding melodies throughout with couple of cool synthesizer interludes named “Lowlands” and “Crater Lake” studded in the middle. “Low Moon” is probably the most different of the songs as it’s a sweeping suspension that tries really hard to wrap things up as slowly as possible. The tenor of this track is well-intentioned conclusion, but I would have really enjoyed some more of Dana‘s stony basslines. But it completes the album’s arc decently. The general formula of Insect Ark is well established on this full length: synths, bass line, drums, and then a coaxing of other electronic melodies. Portal/Well doesn’t go into french-fry mescalin land and isn’t “experimental” in that regard. It plays its trajectories safe in some aspects, but actually does go somewhere, albeit very slowly. 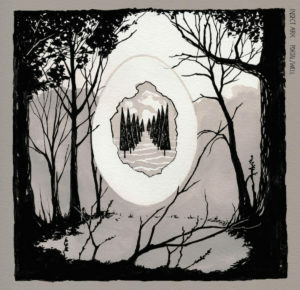 While some of the elements become recycled, Portal/Well‘s fairly pellucid landscaping is not intended to be lazy and cumbersome repetition, but an accessible, slightly bong-ripped set of recurring pleasant things; this is an album you can play on a long drive in the desert thoughtlessly and contently with a lack of noisome jerk-off riffs or pungent harsh noise stomach barbing. Originally released in 2015, Brooklyn’s SGG records decided to give Portal/Well a nice vinyl treatment with a silk screen chipboard jacket adaptation of the original art and for-vinyl mastering. It sounds even more expansive and filmic than on CD in my opinion.